The original Pantheon. From left to right: Aggramar, Sargeras, Khaz'goroth, Norgannon, Eonar, Golganneth and Aman'Thul. The Pantheon were a group of titans who shaped and ordered worlds while watching over the universe and searching for others of their kind. They created the titan-forged, various races of Azeroth, and empowered the Dragon Aspects through the titanic keepers. The entire Pantheon was killed in a battle with their former brethren Sargeras. However, Norgannon cast a spell to protect their spirits and sent them hurtling towards Azeroth in order to merge with the keepers. This failed as the keepers' bodies were unable to handle the titans' souls' entire might. Their spirits faded and all that remained was a flash of memories and feelings that the keepers could not comprehend. The keepers tried to reach out to the Pantheon, but received no answer in return. Eventually, Keeper Ra realized that the Makers had died and fell into a deep state of depression. He left all civilization behind and retreated into the Mogu'shan Vaults, abandoning his kin and mogu followers. As the armies of Azeroth and the Army of the Light launched their united assault on the Burning Legion's capital world of Argus, Magni Bronzebeard, Azeroth's Speaker, discovered that the ruined planet hosted a world-soul within its core. The titan Argus was being tortured and twisted by Sargeras' servants and used to fuel the Legion's infinite army. What remained of the spirits of the Pantheon were somehow brought to Antorus, the Burning Throne, where they were found in the process of being brainwashed by The Coven of Shivarra. It was already too late for the noble Aggramar however whose tortured spirit had been infused into an avatar to serve his dark master. After millenia spent hiding in isolation, Eonar's essence too was recently discovered by the Legion who sent the Legion ship Paraxis to capture her. The Pantheon depicted during Blizzcon 2015, from left to right: Aggramar, Golganneth, Sargeras, Khaz'goroth, Norgannon, Eonar and Aman'Thul. Though no one knows when or why the first titan awoke, legends say that his name was Aman'Thul. He was alone, but he knew that others like himself must exist, and so he set out to explore the myriad worlds of the Great Dark in search of other titans. In time, he found and nurtured other world-souls, rousing them from their slumber and thus causing them to join his noble cause. Eventually, Aman'Thul and his younger siblings formed the Pantheon. They came to realize that order was crucial to finding others of their kind, and developed certain techniques to determine whether or not the worlds they encountered contained nascent world-souls. Over the ages, the titans discovered fewer and fewer world-souls during their travels, but they were not disheartened, because they knew that they had still only explored but a small corner of the immeasurably vast universe. Sargeras destroying the corrupted world-soul. Soon, the Pantheon learned of the demons: chaotic and destructive beings who occasionally clawed their way into the physical universe from the Twisting Nether to terrorize any mortal civilizations they came across. Fearing that these beings would disturb the Pantheon's quest, the titans dispatched their greatest warrior, Sargeras, to cleanse the universe of all demonic influence. Later, this noble champion of the Pantheon was joined by the young and inexperienced Aggramar. Sargeras and Aggramar eventually decided to split up in order to combat their foe more effectively, and it was during this time that Sargeras discovered the plans of the malicious beings known as the void lords. Coming across a planet almost completely infected by the Old Gods, Sargeras learned that the void lords had sent the Old Gods out into the cosmos to infect any worlds that housed world-souls, and if they succeeded, the world-soul would be twisted into an unspeakably dark creature that not even the Pantheon could stand against. Enraged at this discovery, Sargeras cleaved the planet in two, instantly killing the nascent titan it housed. Sargeras immediately returned to the rest of the Pantheon to tell of his discovery, but they chastised him for his rash action, insisting that they might have been able to purge the world-soul of its corruption without killing it. Sargeras tried to convince the other titans that what he had done was right, and that the universe needed to be purged of life in order to prevent the risk of a world-soul becoming corrupted and opening the way for the void lords. Realizing that the others would never see things the way he did, Sargeras stormed off, vowing to cleanse the universe on his own. Sea giants shaping the oceans of Azeroth. After Sargeras' departure, Aggramar continued the hunt for demons in his stead. One day, he sensed the tranquil dreams of a slumbering world-soul from a distant corner of the Great Dark. As the traveled towards the source of the emenations, he discovered the world that would later become known as Azeroth. Within its core was a nascent titan far more powerful than any others the Pantheon had yet encountered, but the world had already been seized by the Old Gods. The nascent titan's spirit remained uncorrupted, but, knowing it was only a matter of time before it succumbed to the Void, Aggramar swiftly returned to the Pantheon and relayed his discovery, arguing that this was proof of Sargeras' claims and that the Pantheon had to take action before Azeroth was lost. Eonar agreed, and convinced the rest of the Pantheon to save the maturing world-soul from the Old Gods. And so, it was decided that the Pantheon would travel to Azeroth and purge it of the malicious Black Empire which had claimed it. However, due to the titans' colossal forms and the risk of irrevocably damaging or killing the world-soul, Aggramar decreed that rather than take action directly, the Pantheon would create servants to do battle in their place. Under the guidance of the forger Khaz'goroth, the titans shaped mighty titan-forged servants of stone and metal to meet the n'raqi and aqiri forces of the Old Gods head on. Though the spawn of the Old Gods, as well as and their elemental servants, were powerful beyond mortal comprehension, their combined forces could not stop the armies of the mighty titans. One by one, the elemental lords fell, and their forces dispersed. However it was discovered that the Old Gods had managed to "infect" the planet so early in its development cycle that they were irreversibly linked with it. Since they could not destroy the Old Gods, the titans decided to chain the evil gods far beneath the surface of the world. Without the Old Gods' power to keep their raging spirits bound to the physical world, the elementals were banished to an abyssal plane, where they would contend with one another for all eternity. With the elementals' departure, nature calmed, and the world settled into a peaceful harmony. The titans saw that the threat was contained and set to work. The titans empowered a number of races to help them fashion the world. To help them carve out the fathomless caverns beneath the earth, the titans created the dwarf-like earthen from magical, living stone. To help guard and protect the Vale of Eternal Blossoms, the titans created the stone mogu to guard and protect the Vale and the surrounding region. To help them dredge out the seas and lift the land from the sea floor, the titans created the immense but gentle sea giants. For many ages the titans moved and shaped the earth, until at last there remained one perfect continent. At the continent's center, the titans crafted a lake of scintillating energies. The lake, which they named the Well of Eternity, was to be the fount of life for the world. Its potent energies would nurture the bones of the world and empower life to take root in the land's rich soil. Over time, plants, trees, monsters, and creatures of every kind began to thrive on the primordial continent. As twilight fell on the final day of their labors, the titans named the continent Kalimdor: "land of eternal starlight". Satisfied that the small world had been ordered and that their work was done, the titans prepared to leave Azeroth. However, before they departed, they charged the greatest species of the world, the dragonflights, with the task of watching over Kalimdor, lest any force should threaten its perfect tranquility. There were many dragonflights in that age, yet there were five flights that held dominion over their brethren. It was these five flights that the titans chose to shepherd the budding world. The greatest members of the Pantheon imbued a portion of their power upon each of the flights' leaders. These majestic dragons became known as the Great Aspects, or the Dragon Aspects. Thus empowered, the Five Aspects were charged with the world's defense in the titans' absence. With the dragons prepared to safeguard their creation, the titans left Azeroth behind. In the Pantheon's absence, the various titan-forged continued to shape and order the surface of the world. Meanwhile, in the distant reaches of the Great Dark, Sargeras, having now broken his ties to the other titans, meditated on the fate of the universe. As doubt and despair twisted his thoughts, he reached the conclusion that to spare the universe from the clutches of the void lords, it had to be destroyed. To accomplish this, he would need an army — thus, the traitorous titan returned to the demonic prison world of Mardum, where he had imprisoned his defeated demonic foes, and shattered it to unleash the demons upon the universe once more. In the process of doing so, the former champion was twisted into a fel-corrupted, hateful being. Sargeras united the chaotic creatures under the banner of the Burning Legion, and so began the Burning Crusade to purge all of creation. After a devastating confrontation between Sargeras and his former student Aggramar, the Pantheon began preparing for war. The Pantheon and the Legion met near a world known as Nihilam. Aman'Thul pleaded with Sargeras to end this madness, telling him of the fledgling world-soul Azeroth, a being that would one day be able to stand against the void lords. Sargeras was unmoved. Aggramar, thinking that his former friend could still be reasoned with, approached Sargeras unarmed, but in response the fel-corrupted titan killed Aggramar with a single blow. Outraged, the Pantheon attacked, but even the combined might of the titans could not stand against the dark titan's fel might. Before long, the titans were all dead. Sargeras declared the Legion victorious and set off to find Azeroth, not knowing that Norgannon had weaved a protective shroud around the titans' spirits during his final moments. The now disembodied souls of the Pantheon then hurled out through the cosmos. Eventually, the spirits reached Azeroth, slamming into the keepers that the Pantheon had assigned to watch over Azeroth. For a brief moment, each of the keepers were overwhelmed by an influx of fragmented memories. Puzzled by this, they called out to the Pantheon for answers, but never received a reply. Ra was the only one who realized that the influx of titan power felt by the keepers was the very last remnant of the Pantheon. He extracted what remained of the soul of Aman'Thul, storing it in a vault near the Vale of Eternal Blossoms. Overcome with despair, Ra then retreated into the catacombs beneath the land to meditate on what he had learned. Centuries later, Ra showed Aman'Thul's spirit to the mogu warlord Lei Shen to explain his silence and how the world was beyond saving, but instead of reacting in the same way that Ra did, Lei Shen claimed the power of both the keeper and the remaining fragments of Aman'Thul. Lei Shen would then use this power to establish the first mogu empire. The Halls of Origination, one of the facilities left behind by the titans. The titans left many titan-forged behind, including the keepers, to protect Azeroth. Before leaving, they gifted the latter with the Pillars of Creation. Some time later, they empowered Dragon Aspects from afar and through the keepers. The titans are now a subject of significant interest on Azeroth, at least for the dwarves — especially the Explorers' Guild. Their part in Azeroth's history lies far, far back in time, although Sargeras has an active role in recent conflicts through the Burning Legion. The denizens of Azeroth know very little about the titans save for scraps the dwarves have unearthed and some vague night elf folklore. Simple humans believe that the world was shaped by the titans themselves. Few human scholars actually believed the mighty demigods even existed. Legend holds that the great ones shaped the land when the world was young, then left the world to its own devices. The ruins and buried cities that remain on Azeroth — Uldum beneath the Tanaris Desert, Ulduar beneath the Storm Peaks of Northrend, ancient libraries in Vale of Eternal Blossoms, and Uldaman beneath the dwarven home of Khaz Modan — are known to a few to actually be "titanic" ruins. Most mortals believed that they were only ancient ruins. During the World of Warcraft Q&A panel at BlizzCon 2013, it was officially confirmed that Draenor was visited by the titans, however their involvement was far less extensive than it was on Azeroth. The Highmaul ogres believe they were born when "the Forgers" squeezed the light from the enormous ball of fire that would become Draenor. They made the ogres from the same smoking clay and gave them dominion over stone and earth. Through the storyline of Ulduar it was discovered that Azeroth had a failsafe, a signal triggered by the death of the Prime Designate, is used to alert Algalon the Observer as the first warning sign of systemic planetary failure. Algalon then translocates to Ulduar, and runs planetary diagnostics of its vital systems to analyze the world for corruption, such as in its life-support systems and defense mechanisms. If sufficient corruption is found, Algalon will send a signal to the titanic facility in Uldum and request planetary re-origination. The re-origination device the keepers built into the world, triggering a huge pulse, breaking down the planet — and all life on it — into base elements of rock, metal and gases. The machine then uses these elements to reconstitute the world into its original planetary blueprint, starting over from scratch. As the titans are considered to be benevolent, shaping worlds and encouraging life to flourish, it may seem odd that they are willing to effectively destroy a world full of sapient beings in order to start over. However, they appear to do this in thinking along the lines of 'the needs of the many outweigh the needs of the few': they consider the re-origination of a corrupted world to be in the best interests of the universe at large. The Pantheon at the Seat of the Pantheon. Clockwise: Golganneth, Khaz'goroth, Eonar, Aman'Thul, Aggramar, and Norgannon. Though the titans of the Pantheon were dead, pieces of their spirits remained. Sargeras deemed them great source of power, captured them, and sought to manipulate and corrupt these pieces. It is still unexplained how Sargeras found the soul fragments but for existing theories see #Speculation. The titan souls were tortured by the Coven of Shivarra within the core of Argus, in Antorus, the Burning Throne, except for Eonar who managed to stay hidden until recently. Aggramar was the first to break and fall to Sargeras's will. His corrupted soul was infused into an avatar. After the Pantheon was freed and Argus was defeated, Sargeras struck out at Azeroth and wounded her heavily in Silithus. The Pantheon then used the last of Argus' power combined with theirs and imprisoned him within the Seat of the Pantheon. Illidan Stormrage, who stayed behind while his comrades left, now serves as Sargeras's jailer. In the aftermath, Khadgar says that Azeroth is the only titan left. The Pantheon depicted in The Warcraft Saga - Issue 1, from left to right: Norgannon, Khaz'goroth, Golganneth, Eonar, Aggramar, Aman'Thul and Sargeras. The Makers or the Creators, most commonly used by their own creations. The Forgers, by the Highmaul ogres. The Travelers, by the trolls. The usurpers, by the mantid and Highlord Demitrian. The Shapers by Highlord Demitrian. The Hall of the Keepers, Hall of the Crafters, Hall of the Watchers, and Hall of Shapers may be referring to titan or keeper titles. The Burning Legion managed to find and capture what was left of the Pantheon's diminished souls, imprisoning them within Antorus where they were being tortured and brainwashed into Sargeras' service by the Coven of Shivarra. The first titan to succumb and join his Dark Pantheon was the once mighty Aggramar, whose essence was infused into an avatar. The heroes of Azeroth and the Army of the Light together managed to defeat the shivarra priestesses and free the titans' spirits. Magni Bronzebeard remained behind while the armies moved on to defeat the corrupted Aggramar, so that he could offer them a little bit of comfort. With Aggramar's defeat, the Pantheon was freed of their corruption, after which they brought the world-soul of Argus to their place of power, the Seat of the Pantheon. In the end, Sargeras' Dark Pantheon didn't come to pass. Had he succeeded, no force in the universe could have stopped him. The titans crafted the Celestial Orb of Souls as a gift for their favored creations. They also created [Val'anyr, Hammer of Ancient Kings]. Some of Aman'Thul's essence imbues the Eye of Aman'thul and as such, all the citizens of Suramar. The Pantheon was once described as an elite sect that ruled over the titans, indicating a greater titan population beyond the Pantheon. Chronicle Volume 1 revealed that the Pantheon was in fact the name given to the only known group of titans in existence. The Pantheon was once credited with directly shaping Azeroth and creating most of its races, but this is now attributed to the keepers. This is also an in-universe knowledge shared at least among the humans and dwarves. The last remnants of Aman'Thul lingered within Ra in the form of a soul fragment. As such, it is likely that soul fragments of the other members of the Pantheon remained within the other keepers. Aman'Thul's soul fragment was then passed on to Lei Shen when he devoured Ra's heart. Since Wrathion then ate Lei Shen's heart in turn, it is more than likely that the fragment passed on to him. This is supported by the fact that in doing so, Wrathion received the same vision as Ra did thousands of years ago when he was infused with Aman'Thul's last remnants, a vision of infinite perfectly ordered worlds and stars. Although it remains unexplained so far how Sargeras obtained the Pantheon's souls, there are a few possibilities. When asked about it, Jeremy Feasel pointed out that the Burning Legion attacked Ulduar during the course of World of Warcraft: Legion, and that while we were "enjoying Legion Assaults we certainly weren't in Pandaria or Uldum". It is thus possible that when the Legion attacked Ulduar and kidnapped the titan keeper Hodir, they could have removed Golganneth's soul from him. The Legion attacked Pandaria twice, in both Kun-Lai Summit and the Jade Forest. Uldum is also where Ra installed the Forge of Origination. It could be that the Legion was trying to track Aman'Thul's essence down. 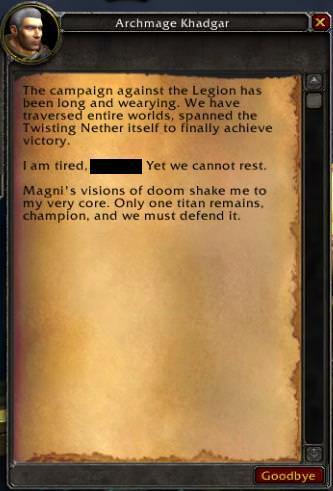 Wrathion's absence from the events of Legion may be explained by the Legion finally finding it and capturing him. Aggramar, Khaz'goroth and Norgannon's souls may have been released when their respective keepers died. They then might have been collected by the Legion. It is also possible that the titans, feeling that they could not possess the Keepers, left them and went into hiding in their respective sanctuaries as Eonar mentions in Elunaria. A fragment of their souls would be left behind, which is what Ra found and extirped from his body.